The 2 Alpes is a dynamic and sporty ski resort in Isère, at the threshold of the Oisans region and the Ecrins national park. It enjoys the optimal amount of snow of the Northern Alps, and the privileged climate of the Southern Alps. It is reputed for its vast skiing area, adapted to beginners and expert skiers alike, as well as its high quality ski lifts and après-ski activities. The whole family will be enchanted by a skiing holiday in the 2 Alpes, awarded the label « Famille Plus Montagne ». 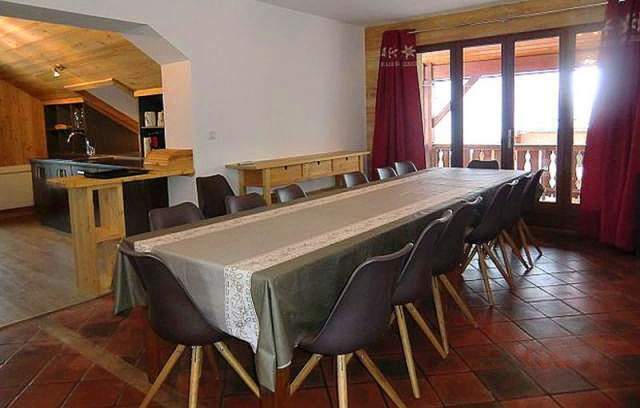 Erika Chalet, with a capacity of 16 people, is located in the center of Les 2 Alpes, facing the shops and the ski lifts of the resort that open the doors to the ski area. -Adventure park, beach-volley, football, horse-riding, 9-hole golf course , summer sledging, dévalkart, minigolf, Paint-ball, trout fishing, quad bike, motorbike trial, tennis, archery, mountain-bike (bike rides and downhill tracks), trampoline, inflatable structures, paragliding..
- Sports' centre, L’Acqua Center with : sauna, whirlpool bath, hammam, body building..
225 km of marked trails. Station equipped with snow cannons (225) and 23 slopes with artifical snow. Possibility of cross-country skiing, ski slopes of La Molière, Petit Alpe, plus 1 track in the village of Venosc accessible from the resort (take the cable car, about € 6 two way trip). Card for free circulation. Snowpark: This area of 24 hectares, on the trail of La Toura (2600 m) includes a boardercross (12 banked turns and jumps), a half pipe, jumps modules and a carving space. It is animated by a professional, and regularly hosts contests, sport events and tests, making it a top ski resort. This chalet of 250m suitable for 16 people facing west and south, is made in traditional and modern style. It offers a stunning panoramic view of the massif of 2 Alpes from its 40m² terrace. Magnificently equipped, the chalet has a kitchen equipped with oven, microwave, dishwasher, washing machine, ceramic hob, coffee maker, raclette, freezer, refrigerator. During your ski holiday you will enjoy the comfort of his large dining room of 85 m² and its lounge with fireplace. The Erika Chalet situated in 2 Alpes resort, consists of 5 bedrooms from which 4 triples with double bed of 160 cm and a single bed of 90 cm and a quadruple room with 2 bunk beds. Each bedroom has its own shower room or bathroom, totaling 3 shower rooms and 2 bathrooms plus 5 toilet. Price in euros, for one week's accommodation (7 nights). Big screen TV, internet access, fireplace, ski locker and bike shed, a garage for 2 cars and 4 outdoor private parking spaces.